Perhaps all that needs to be said about praying a nation into war was said by Mark Twain in his short narrative entitled “The War Prayer.” If you haven't been chilled by it I invite you to take a few minutes right now and use it to prepare yourself for the other realizations alluded to in my title. Our consideration of so-called emergency powers or war powers should begin and end with a thorough knowledge of the Constitution. It is sheer idiocy to pretend that the President or anyone else could possess a lawful power that magically appears as needed for every real or pretended emergency – a power for which he must never be called into question!? Does he take a modified Oath to the Constitution that goes something like “...to Protect and Defend the Constitution from all enemies foreign and domestic... 'unless something comes up. '” ??? Either our recent presidents despise the Constitution or they are ignorant of it. One has but to compare their rhetoric, their actions, and their pious moralizations – all void of intelligent Constitutional meaning and dialogue. More importantly, they not only disobey the Constitution, they deliberately avoid teaching it to their most ignorant constituents either by word or by example. Are you waiting as I am to hear an American president [cogently] say “by the power vested in me by Article II, Section such and such [pause]... please America, open your pocket Constitutions and let's us just read it together...” ??? Big companies make Big money out of Big Wars. 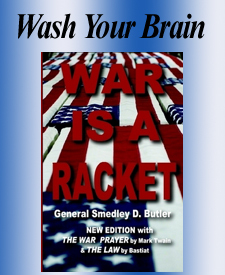 Just read “War Is A Racket” by Major General Smedley Darlington Butler, USMC Retired, – a man who discovered the truth of that title by doing research into wartime vs. peacetime corporate profits and visiting a lot of veterans' hospitals. Again, enough is said about that by Major General Butler. Truly we should read it and weep. We can easily bring that book up to date by multiplying the numbers of millionaires and billionaires that were made by World War I. Then factor in the trillionaires that will be made out of the next few wars. A few names have been changed among the largest companies - mergers and acquisitions you know. When someone wants to go to war ask yourself who will be making the money and who will be doing the paying, the fighting and the dying. It is arguable that the paper coupons passing for money in the U.S. are a type of Wartime Money - not lawfully but de facto. From the Constitutional Convention: "Mr. WILSON & Mr. SHERMAN moved to insert after the words "coin money" the words "nor emit bills of credit, nor make any thing but gold & silver coin a tender in payment of debts" making these prohibitions absolute, instead of making the measures allowable..." See Madison's Notes on the Federal Convention August 28, 1787." The great American historian George Bancroft can help you get up to speed on the deleterious effects of paper money in his work entitled "A PLEA FOR THE CONSTITUTION OF THE UNITED STATES - Wounded in the House of Its Guardians." "...paper money is the dry rot, which silently and unseen consumes the beams and joists which support the house and its floors." For some reason the Founders and Framers reminded us again and again of two evils that could devastate the Republic and ravage our liberties. They were Standing Armies and Paper Money. Did they know what they were talking about?